Join us for the July SBID Business Brunch hosted by luxury kitchen appliance specialists, Sub-Zero & Wolf. 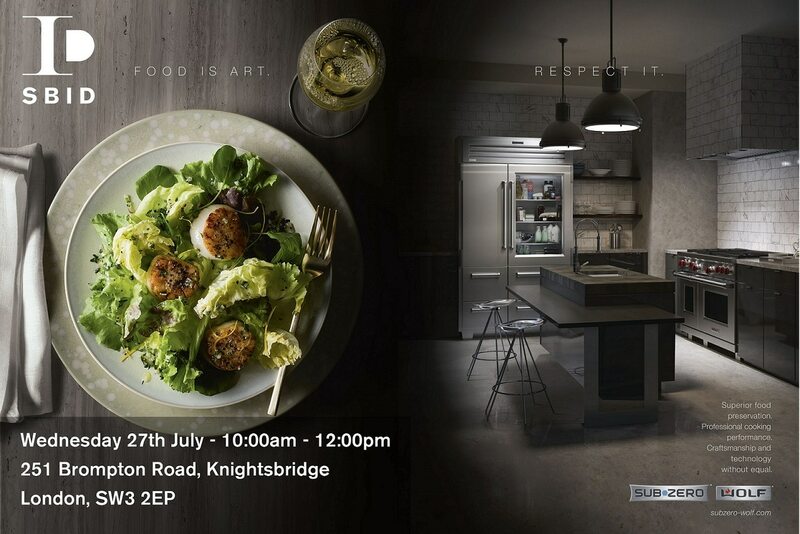 The event will be held at their glamorous Knightsbridge showroom with a delightful brunch made the resident Chef Bruce Cole, who will be cooking on Sub-Zero & Wolf appliances. Sub-Zero & Wolf are the leading manufacturer of premium refrigeration and cooking appliances worldwide, and are synonymous with state-of-the art kitchen technology, delivering specialist culinary results in the home without compromising on style or luxury. 2016 sees the continuation of the launch of Sub-Zero & Wolf’s New Generation appliances, the largest product roll-out in the brands’ 70 year history. Encompassing integrated refrigeration, wine storage, convection steam ovens, cooktops, ventilation and coffee system, this is set to be the most comprehensive and innovative range of luxury cooking and cooking appliances on the market.